This beautiful Forever OneTM ring showcases a 6.0mm, four 5.0mm, 1.7mm and 1.6mm round brilliant cut moissanite gemstones. 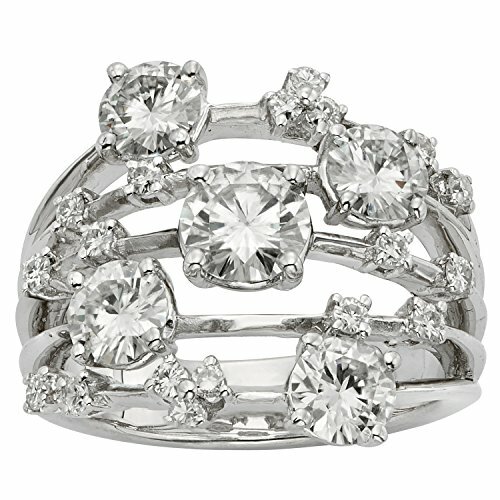 Beautifully crafted in rhodium plated 14K white gold and secured in a four prong setting. Ring size 7. The primary 6.0mm gemstone has a Diamond Equivalent Weight (DEW) of 0.80ct (Actual Weight 0.68ct). The total Diamond Equivalent Weight (DEW) including all twenty-three gemstones is 3.13cttw DEW (Actual Weight 2.62cttw). Charles & Colvard Forever One G-H-I is a near-colorless gemstone with a slight icy hue. Cut from our high-quality material and possessing the same optical properties as our D-E-F gemstone, G-H-I has a cool-toned body color that gives it a unique look and differentiates it from other gemstones on the market today. This beautiful Forever OneTM ring showcases a 6.0mm, four 5.0mm, 1.7mm and 1.6mm round brilliant cut moissanite gemstones. The primary 6.0mm gemstone has a Diamond Equivalent Weight (DEW) of 0.80ct (Actual Weight 0.68ct). The total Diamond Equivalent Weight (DEW) including all twenty-three gemstones is 3.13cttw DEW (Actual Weight 2.62cttw). Charles & Colvard Forever OneTM G-H-I is a near-colorless gemstone with a slight icy hue. Cut from our high-quality material and possessing the same optical properties as our D-E-F gemstone, G-H-I has a cool-toned body color that gives it a unique look and differentiates it from other gemstones on the market today. Color grades are based on the Gemological Institute of America's diamond color grading scale.